The hills are alive, to the sound of dead hard drives! I saw this on /., and got very excited. I quickly opened up the site, then it hit me just how sad it was. However, I don’t care. This site goes off like a sog in a frock. I can’t think of a decent way to describe it, so I’ll just quote some text from the site itself. 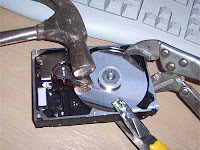 “These are some typical sounds we hear in our data recovery lab.